If your particular error has already led to embarrassment, physical pain, the specter of jail time and harm to others, you cannot erase the past. You need to accept the reality of your situation and embrace responsibility for where to take your life from here. It might be some consolation to consider other huge mistakes people have made throughout history—to provide a sense of context. You’re not the only one who’s ever regretted a moment. 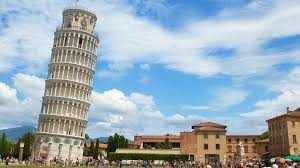 No one knows the original architect of the Leaning Tower of Pisa in Italy. But whoever it was made a bad calculation when determining that the tower only needed a three-meter (nine-foot) foundation in soft soil to support the building’s eventual 183-foot height. Builders discovered the mistake shortly after construction began in 1173, because the tower started sinking on one side after they had finished building the second floor. Fortunately for the tourist trade in Pisa, the town had to halt building for almost 100 years because of the wars being waged in the area. That gave the ground underneath the tower some time to settle into a firmer foundation. The next architect who tackled the project decided to compensate for the building’s tilt by making the floors above the second level taller on one side that the other. So the building is not only tilted, but it has a curved appearance as well. The tower actually continued to tilt a little more each year until the beginning of the 21st century, when the town began restoring and shoring up the tower. While the tower is no longer in danger of falling completely over, it still retains its tilt, with the top of the tower slanted almost 13 feet away from the center of the building. Offshoretechnology.com calls the Piper Alpha Disaster in the North Sea, United Kingdom, the worst offshore oil disaster in history. The incident, which killed 167 people at the offshore oil platform, was the result of someone’s failure to replace a key valve on a pump. Workers were giving a condensate injection pump a routine inspection in early July 1988, and as part of that work they removed the pressure safety valve and put in two temporary flanges. The pump was supposed to remain off until the pressure safety valve was back in place. The day shift wasn’t able to complete the inspection work before the night shift came on, and somehow the information about the missing safety valve never got passed on. So the night crew turned on the pump, and gas started leaking. That resulted in a series of gas explosion that killed all but 61 of the 226 workers on the rig. The fire raged out of control for three weeks. The space shuttle Challenger lifted off from the Kennedy Space Center in Florida on January 28, 1986. Just 73 seconds later, the capsule exploded, killing all seven astronauts aboard. One was a teacher from New Hampshire, Christa McAuliffe. An investigation traced the tragic loss of the space capsule back to an O-ring seal on Challenger’s solid rocket booster. Both NASA managers and the company that designed the rocket booster had made the mistake of ignoring warnings from NASA engineers who said that cold weather could make the seals become brittle. This fatal mistake brought space shuttle launches to a halt for two years. On March 11, 2011, an earthquake hit the Japanese island of Honoshu, triggering a tsunami that led to three nuclear meltdowns at the Fukushima Nuclear Power. According to the independent commission that investigated the incident, both the company that ran the power plant (TEPCO) and the Japanese government made mistakes by not anticipating the possibility of such an event and planning for it, and by not establishing, in advance, a clear line of authority and communications plan between all of the parties involved with controlling the disaster. Although no human deaths have been linked directly to the disaster, the area around the plant remains contaminated, with 174,000 people unable to return to their homes and plants and animals in the area showing some malformations. California’s largest-ever wildfire began on October 25, 2003, when a lost, dehydrated and disoriented hunter in the Cedar Creek Falls area of Cleveland National Forest lit a fire to signal his location to searchers. That was the first mistake. The second mistake occurred when a helicopter pilot looking for the hunter called 911 to report that he was seeing smoke in the forest. The 911 operator told him that they knew about the fire and it was nothing. But calls about the fire kept coming in, and emergency workers eventually made it to the scene. Unfortunately, the fire spread rapidly. Before firefighters got it under control ten days later, the Cedar Fire had killed 15 people, destroyed 2,232 homes and burned more than 273,000 acres of land. Emergency workers did manage to rescue the hunter who made the mistake of lighting the signal fire. He was tried in court and eventually received a sentence of six months’ imprisonment and 960 hours of community service. Did you know there was a third founder of Apple Computer? Steve Wozniak and Steve Jobs had another partner when forming the company, Ronald Wayne. He provided the administrative oversight for the new company, gaining a 10 percent share for his efforts. When scientists in Brazil tried crossing a European honeybee with an African bee, they were hoping to create a bee that would produce more honey. But that didn’t happen. Instead, they produced a highly aggressive bee that was five times less effective in producing honey than the European bee. The second mistake the researchers made was letting 26 swarms of these bees escape from the laboratory. Today they threaten inhabitants in South America, Central America and Mexico as well as California, Arizona, Nevada, Utah, Oklahoma, Louisiana, Arkansas and Texas. The Africanized honeybees are easily angered and stay that way, and they attack in large numbers and sting multiple times. They have killed more than 1,000 people since they were released. The crew of the Titanic was keeping an eye out for icebergs on April 14, 1912. But they were handicapped; they didn’t have access to the ship’s binoculars because those binoculars were locked away and no one had the keys. The White Star Line had decided at the last minute to replace the scheduled second officer, David Blair, with another more experienced officer. So the ship sailed off without Blair, who had the locker key in his pocket and forgot to pass it on to his replacement. That left the crew without access to the binoculars; they could only use their naked eyes while on watch, and missed seeing the iceberg that sunk their ship until it was too late. It was a costly mistake; 1,522 passengers on the Titanic perished that night. This tour of monumental mistakes in recent history has hopefully given you needed perspective on what happened to you recently. These comparisons obviously are not intended to make light of the challenges you face, nor are they offered to deny the gravity of your situation. No matter what happened and how scared, frustrated and alone you feel right now, you’re not without resources. Call our experienced DUI defense team for insight into how to approach the next few weeks strategically.